How to use iYURA Kesaradi™ Oil? It’s fairly simple to get the magic going when it comes to this oil – it takes just 3 drops! “I have combination skin and have tried so many products that promise all kinds of things and been disappointed. However, I have finally found an amazing product that has helped my acne but improved my skin overall. Since I started using these face oils I have received so many compliments on my skin with comments like “you are just glowing” “your skin looks amazing”. I have had such great success that I had my teenage son who had terrible, very red inflamed acne and his skin is entirely clear after a month. He thanks me daily for getting him to use it. 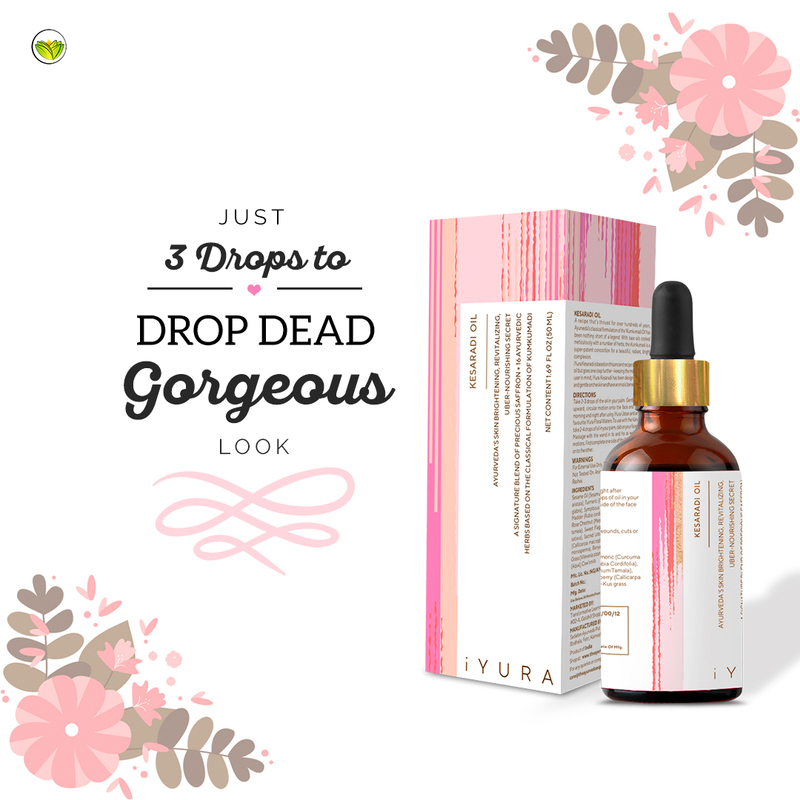 3 drops of this precious unguent from the ancient treasure box of Ayurveda really seem promising! A beautifying oil that provides a kind of warm moisture unlike a face cream, and yet is good friends with skin that’s scared of oils, iYURA Kesaradi™ Oil is changing the definition of what ‘face oils’ are supposed to feel like! iYURA Kesaradi™ Oil is a power-punch of a really interesting combination of ingredients like ‘red-gold’ or the world’s most expensive spice – Saffron -, the queen of flowers, much loved by the beauty-world – Rose – , the golden spice or the legendary healer – Turmeric –, along with 4 other exotic flowers and 11 herbs found in the Asian subcontinent. A lightweight, amber-colored emollient, iYURA Kesaradi™ Oil is a daily use face oil that gives your skin an instant glow, instant deep moisturization, and intense fortification without using a single chemical, preservative or any mineral oil. But that’s not all, the instant effects of Ayurvedic products are really only the cherry on top – the largest chunk of the pie lies in the astounding long-term results it is delivering to thousands of women in the USA, Canada, and the Australian subcontinent, even as you read this! Not only do Saffron, but Rose and Turmeric also promise a golden glow and an uber-soft appearance of the texture of the skin, powerhouse herbs like Lodhra, Manjistha, and Vetiver help give a toned, clarified look to the complexion. The unassuming 3-layered aroma of this oil will disarm you the moment you open the bottle and let 3 drops of this oil fall into your palm! A very unique aromatic experience, the oil will ease and uplift you in three phases – the first layer of saffron will immediately awaken you to an exotic, promising new-ness, the second layer of rose will make you slip into a pleasant euphoria and just as it begins to take you away, the grounding aroma of sesame makes you feel, calm and settled! It’s a very unique experience, indeed! What’s the history of this oil? This oil was first mentioned millennia ago in an ancient Ayurvedic text called ‘Ashtanga Hridayam’, which historians stipulate to have been written in India between 500 BC – 250 BC, and then elaborated upon by other Ayurvedic texts like ‘Chakradutt’ and ‘Yoga Ratnakar’, which have been traced back to around the 11th and 17th Century AD respectively. Since the concentrate of Kumkumadi itself could be too strong for some, especially when it comes to western skin exposed to extremes of weather conditions, as well as aromatic aesthetics, iYURA Kesaradi™ Oil was developed to deliver the power of the concentrate, but gently so. 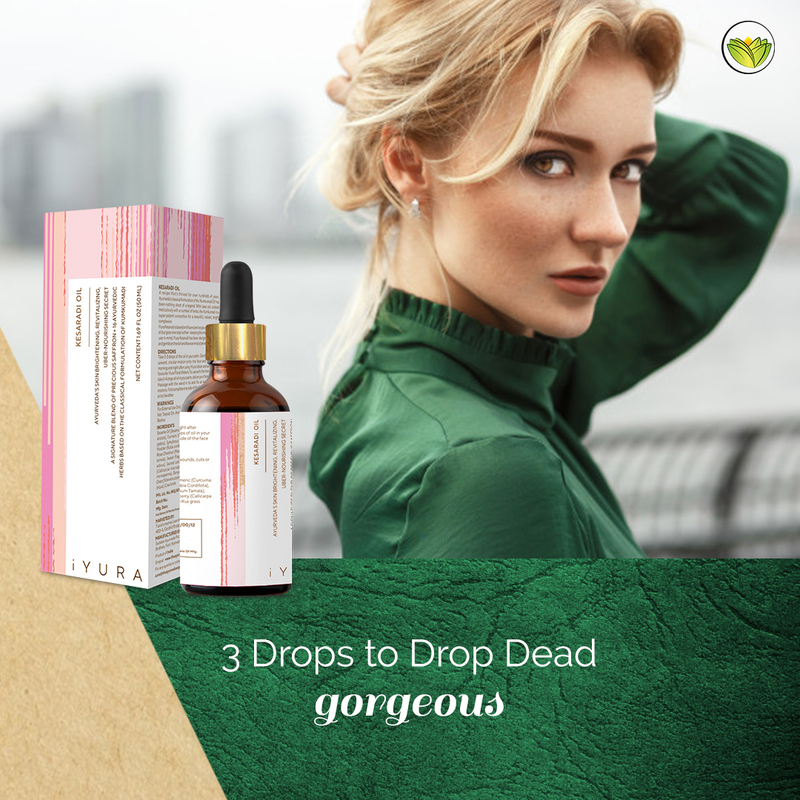 iYURA Kesaradi’s polyherbal formula was specifically designed for a modern, western woman who wants to opt for pure, natural, Ayurvedic beauty, who wants results with no compromise.